This reminds me of those ghettoblasters from the 80's that idiots used to walk around with on their shoulders. And they toook up about 10 batteries which lasted for all of 45mins. These guys have the solution, albeit it takes 4 of them to carry it. 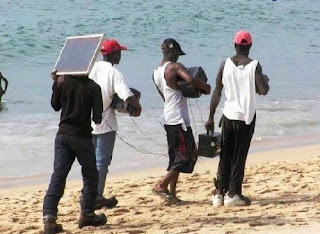 A full sterero system on the beach with a solar panel. Funny.